ATLANTA, GA--(Marketwired - Apr 13, 2015) - JW Marriott Atlanta Buckhead is excited to take part in the 25th Annual Susan G. Komen Greater Atlanta Race for the Cure® on Saturday, May 9. This luxurious Buckhead hotel is connected to Lenox Square Mall, the location of the race start. To celebrate the Race and what it stands for, the hotel is offering an exclusive deal to runners, spectators and supporters alike and will be draped in pink as tribute to the cause. To further promote breast cancer awareness, the hotel will also be donating $10 per booked room for each night stay during the event to the Susan G. Komen Greater Atlanta organization. JW Marriott Atlanta Buckhead is honored to do everything it can to support the Susan G. Komen Race for the Cure Series®, which has become one of the largest fundraising and awareness events for breast cancer in the world. To reserve the Race for the Cure at JW Marriott Buckhead Atlanta Package, be sure that promotional code YX1 appears in the Corporate/Promotional code box when making an online reservation, or call 1-800-228-9290 in the US and ask for promotional code YX1. Discover the timeless elegance of our hotel in Buckhead, GA, located in the heart of this vibrant business, shopping and entertainment district. The JW Marriott Atlanta Buckhead is situated nearby the upscale shopping center, Lenox Square, and across the street from the Lenox MARTA station. This hotel's luxurious environment in Buckhead, Atlanta, has been crafted for approachable leisure. Experience a gorgeously designed lobby, deluxe amenities and personal service at one of the most extravagant hotels in Buckhead, Georgia. For more information, to make a reservation or to submit a request for proposal, call 1-800-613-2051 or visit www.JWMarriottBuckhead.com. Komen Atlanta is the local resource for breast cancer screening, diagnostic and support services. Through events, such as Race for the Cure, and contributions, Komen Atlanta raises funds to enable women to detect and survive breast cancer. Seventy-five percent of all funds stay in Atlanta to provide breast health services for women who could not otherwise afford them. Twenty-five percent supports national research efforts to finding a cure. 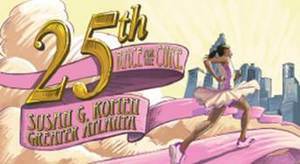 Komen Atlanta has raised more than $41 million since its inception in 1991. Komen Atlanta is part of the national Susan G. Komen organization, which strives to save lives and end breast cancer forever. Komen is the largest private funder in the fight against breast cancer and has invested over $2.5 billion toward the cause. For more information visit www.KomenAtlanta.org. 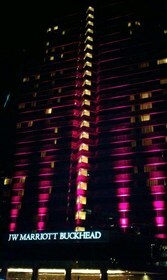 JW Marriott Atlanta Buckhead lit up in pink in tribute of the Susan G. Komen Atlanta Race happening May 9. As one of the premier Atlanta Buckhead hotels connected to Lenox Square, runners and other guests will experience exceptional service, deluxe amenities and first-class accommodations. JW Marriott Atlanta Buckhead is offering one of the more exclusive Buckhead, GA hotel packages for the Susan G Komen Atlanta Race for the Cure.